I decided to make this nice Pink-Eye- Tutorial. It's like really simple and not to much color, but still really shimmery. Step 1: Just put the eye shadow on top of your lid. 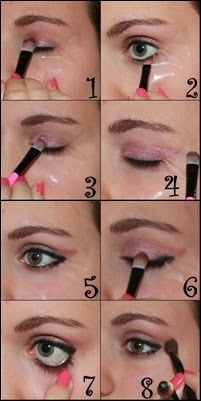 Step 2.: Add the same color, under your eye as you would use a kajal pen. 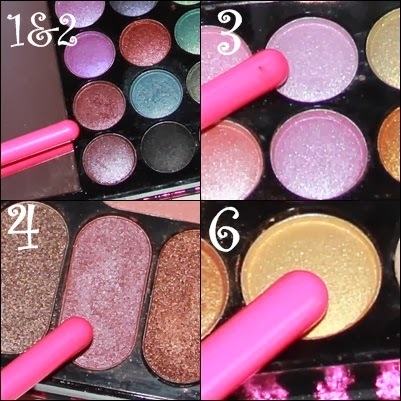 Step 3: Add a brighter pink in the inner corner of your lid. Step 4: Add the darkest & most shimmering pink at the outer corner. And just ponited it out like you see in the picture. Step 5: Now do the eyeliner. I recommend doing this with e kajal pencil so it's way easier to blend it out after. Step 6: Add a little bit of gold shadow in the middle of your lid. Step 7: So this step is optional. I prefer adding some kajal pen also in my wather line. Step 8: Just blend the dark pink of step 4 out. Step 9: Put on some mascara. If you have questions or request for any other tutorial, just leave it in the comments. And: if you do this tutorial, send me your picture on Instagram & Twitter. Could you do a tutorial on the best way to apply eyeliner? Well first things first. I wish you a very Happy New Year full of Joy and Happiness. Second Welcome to the world of Beauty and Fashion Bloggers. Third Great post. Thx for the tutorial. Love the eye make up on you, actually I love the complete make up, you look beautiful. Would you like to follow each other on GFC? Please let me know on my blog so I can follow back. Thank you. Thank you a lot. I wish you a very Happy New Year full of Joy and Happiness too.